1950s' car racing game by Glevum Games (England). Homepage. This page: Fun-a-plenty with this English-made car racing board game from the 1950s. "Motor Race" by Glevum Games, England. 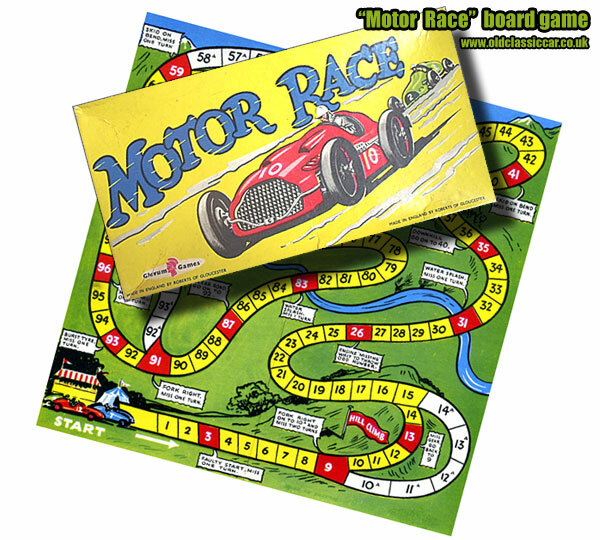 Unlike a similar car racing game of the 1950s that features in this section, the manufacturer of the example shown below is known. It was produced in England by Roberts of Gloucester, under the name of Glevum Games, and like the other game I've mentioned, the box features two fearless racing drivers going at it, hammer and tongs, determined to win their on-track battle. The lead driver in car number 10 appears to be driving a red, front-engined Italian machine (Ferrari, Maserati? ), while the car harrying him is presumably being driven by a British driver, possibly in a rear-engine car (Cooper?). The board is a small folded piece of card, onto which the racing course has been laid out, including a series of perils that the competitors would be keen to avoid; these include the engine "missing", a difficult climb, skid on bend, and a water splash. The cars date to the mid/late 1950s, so this is probably the approximate date of this game. Simple plastic counters act as the cars, while a small dice and shaker take care of each players' moves. Players throw the dice in rotation and score points according to the number thrown, moving their pieces after each throw. A player throwing six has another throw. A player throwing so as to bring his piece on any of the coloured spaces or accidents, must at once go back six points. If in going back, a piece should again rest on an accident space, the player must go back another six and continue going back until his piece rests on an open space or number. The first piece arriving at "Finish" (167) wins the race, but the players must throw the exact number required to win. Glevum Games. Made in England. The firm of Glevum Games, a creation of brothers Harry Owen Roberts and John Owen Roberts, was at one time the largest producer of childrens' toys, games and other items, operating from their manufacturing premises in Upton Street, Gloucester, from 1895 to 1956, at which time they were taken over by Chad Valley. For this reason, "Motor Race" must have been one of the final products they sold. Return to the car-related games section, where, for instance, a pre-war game by Peter Pan titled "The Grand Prix Motor Race" is featured.